From the time Kathy O’Malley was six years old, when her grade school teacher praised her simple drawing of a bumble bee, art has been her passion. 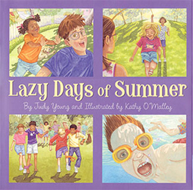 After earning a Bachelor of Fine Arts degree from Columbia College in Chicago Illinois U.S.A., Kathy embarked on a rewarding career that has culminated in her realizing her dream job of illustrating children’s books. Her style can best be described as “realistic whimsy,” and her detailed watercolor art has appeared in books, greeting cards, limited-edition collectibles, kitchen product designs, doll designs and more.